Update on the Dakota Access Pipeline. The secretary of Army Corps of Engineers has declined the permit of the Dakota Acces Pipeline! This decision is no where near permanant due to the newly elected president Donald Trump. I feel Mr.Trump is not for the envirment and will push toward the oil companies way becasue he is known for his lucrative buisness. Theres only one hope that the water protectors hope is that there be a new route established. 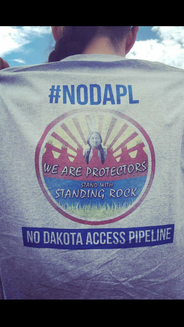 On a side note there is a song by Taboo called ” Stand Up/ Stand N Rock #NoDAPL ” its on Youtube and I would like for everyone to check it out, Its very powerfull.